After a year of industrial unrest, the big boys of the automobile industry in the Gurgaon-Manesar belt are set to initiate negotiations to settle wage agreements with workers for a three-year period. Wage negotiations at India's largest carmaker, Maruti Suzuki India Ltd (MSIL), have already begun, with the union at the Gurgaon unit presenting its charter of demands to the management. The union of the Manesar plant, which saw three strikes in 2011, is also expected to present its demands to the management soon. Following suit, wage settlement issues are also coming up for negotiations at two-wheeler majors - Hero MotoCorp and Honda Motorcycle and Scooter India (HMSI) Ltd. In its charter of demands, Maruti Udyog Kamgar Union (Muku), union of MSIL's Gurgaon unit, has sought a revision of wage, parity between contract and permanent workers and better working conditions. Muku president Kuldeep Jhangu said the union had asked the company to revise workers' wages in line with the rise in production levels at the company. "The company has made accelerated profits over the past few years. We have been partners in it and want the company to recognise it," Jhangu said. He, however, said the union had not asked for a specific increase in percentage terms and had left it open to negotiations with the company. Though the newly formed Maruti Suzuki Workers' Union (MSWU) at the Manesar unit is yet to communicate its expectations, it is also looking forward to an upward revision in wages. 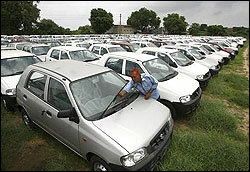 At present, Maruti's Manesar plant employs around 1,400 contract workers and 1,250 permanent workers. MSWU president Ram Mehar Singh said there was no pay parity between contract and permanent workers, with a permanent worker earning Rs 17,000 a month and a contract worker getting Rs 8,000-9,000. "We are still preparing our charter, but an increase in pay is our main demand," Singh said. "There is also the issue of contract labourers. Most of them are paid low wages and the company should increase their salaries and provide them with additional facilities like bus service and medical benefits." The negotiations are crucial as the country's largest car maker has seen three instances of labour troubles at its Manesar unit since June last year. The disruptions in production meant a loss of 74,500 units. Revenues losses for the company mounted to Rs 2,200 crore. In 2009, Muku had secured a six per cent raise for its 3,000-plus members. Meanwhile, an MSIL spokesperson declined to comment on the wage settlement issue. Wage pacts are also up for renewal at Japanese two-wheeler maker HMSI. HMSI Workers Union president Harjeet informed: "Our wage agreement, signed in 2009, lapses in August. Negotiations over wage revisions will start in June." HMSI Workers Union represents 1,800 permanent workers who get between Rs 25,000 and Rs 30,000 a month, while the 4,500-odd contract workers are paid Rs 8,000-10,000, depending on their skills and experience. In the meantime, taking into account the changing ground realities in the region, the world's single largest two-wheeler manufacturer, Hero MotoCorp, already raised wages at its Dharuhera unit last year. For white-collar employees, the pay has been raised by as much as 30 per cent, while workers at the Dharuhera plant have got a monthly pay increase of Rs 6,500 each. The company is likely to draw up a similar pay structure for workers at its Gurgaon and Haridwar plants. The wage agreement at the Gurgaon plant is up for renewal this year. A spokesperson at HeroMotoCorp said: "We maintain cordial relations with all our workers and employees, based on mutual respect. As a company, the welfare of our employees remains our top priority. We conduct revision of wages from time to time keeping in mind the best interests of the workers and the overall business objectives of the company. We also undertake regular surveys on salary structures in the industry and benchmark ourselves as the best in the class for all categories of staff. For several years now, our salaries have been far above the minimum wages prescribed by the government. We will continue with this practice in future as well."